This book develops the situationist critique of The Society of the Spectacle, and Baudrillard’s upping of its ante, to make a virtuosic depiction of a “digital-financial machine that codifies existential flows”. Language has been automated, the acceleration of information exchange subjects everything to itself; what cannot be exchanged is decreasingly communicated. Under the conditions of “swarm” there is no “no” that can be said to this. The “biopolitical sphere of affection and language” is now wholly subjugated to the process of finance capital, something qualitatively different from the conditions of any previous things-based commerce. Berardi’s proposal is that the conventional Marxian tools no longer apply. Instead, he looks back to the French and Russian Symbolists and to the first ‘deregulatory’ breaking of the link between word and world, signifier and signified. He argues that hope lies with the poets who first foreshadowed and predicted the disjunctures that are now universalised; a ‘freeing’ that has is now abolishing the very subjectivities that the poets were inventing. Digitalisation and the freeing of money from things, of dollars from the Gold Standard and so on, has generalised parodically poetry’s technical innovations at the expense of its purposes. But it is to poetry, and more specifically to a corporeal voicing of poetry, that Berardi looks for change, transformation at the “point of conjunction between meaning and flesh”, by “deautomating the word and... reactivating sensuousness”. Berardi calls for the activation of “cruel” desires that refuse compliance with any “finite order of interpretation, but... can be compassionate with the infinite ambiguity of meaning as sensuous understanding”. Part of his strategy is to throw the system’s bankruptcy process back at it; adopting a profligate linguistic insolvency and then refusing to pay, or even recognise, ‘the debt’. Berardi evokes another ‘excess’; the concentration and reconnection of pleasure to proximity and commonality: “Like love, solidarity is not about altruism: it is about the pleasure of sharing the breath and space of the other. Love is the ability to enjoy myself thanks to your presence, to your eyes. This is solidarity... based on the territorial proximity of social bodies”. So far, so inspirational. 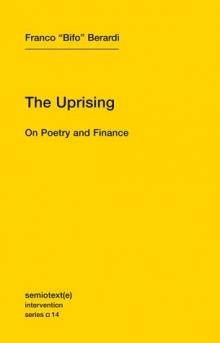 The Uprising reveals its limitations as it seeks to elaborate its argument. It is partially weighed down by its sentimental implication of a previous ‘golden age of things’, but more damagingly (and frustratingly for an enthusiastic reader) by the dearth of examples or descriptions of the conjunctive voicings for which it calls or the refrains that they could express; its examples (mantras, fragments of Rilke) do not match its aspirations. Nevertheless, it is an inspiring call to breaths, bodies and voices in the face of the increasing ineffectiveness of arms against disembodied discourses.